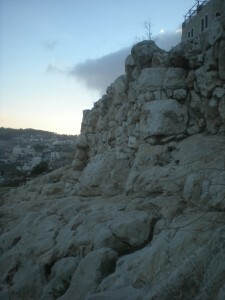 A piece of the wall that surrounded Jerusalem in the time of King Hezekiah. Our siyur (tour) this past Tuesday started in my backyard, almost literally. 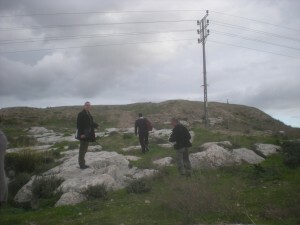 We met at the Tayelet / Haas Promenade, a mere 5-minute walk from my apartment in beautiful Arnona, Jerusalem. This scenic outlook offers an excellent spot to view the geography of ancient Jerusalem. From there, we went to a semi-hidden and little known spot called Ketef Hinnom (Shoulder of Hinnom, a valley in Jerusalem), then hiked through Gei Ben-Hinnom / the Hinnom Valley, and came out at the bottom of Ir David / City of David. We spent the rest of the day winding our way up, down and back up again inside this complex and interesting archaeological site. I am not going to go into too much detail about Ir David, especially since I already discussed it a bit in this post here, but I did want to discuss a few interesting points from throughout the day. I also want to discuss two recent news stories that relate to things we learned about.